I LOVE olives. In fact I love olives so much that I am often really upset when I buy marinated olives and they don't taste great. Sadly this happens all too often so I decided to try making some myself. I am a big fan of shops like Aldi and Lidl because they sell huge jars of olives in oil which is perfect for doing this. You can really boost the flavour of shop bought olives in oil just by leaving them to sit in your new concoction for a few hours, but the flavours really intensify over time so it's always worth making this a few days or even a week in advance. The longer the better really, in fact the jar in the picture was left to marinate for a whole year and it tastes amazing! The beauty of this is that you can add whatever flavours you like. I make one with unwaxed lemon peel, rosemary and garlic that is soooo good (I tried the same method with feta cubes, also brilliant!). I like a good chilli kick so I use chopped fresh red chillies for heat and whole ones for flavour. I grow fennel so usually throw in a few fronds from the garden along with my shop bought seeds but if you happen to have a fennel bulb you could just thinly slice some and bung it in. 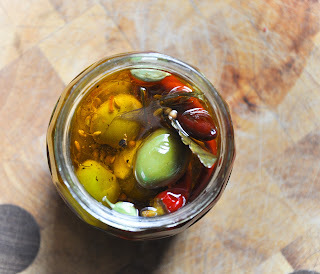 Spoon out half of your olives from the jar and add all your flavours. Top up with olives and eat a few as there will now be too many fit back in! You want to make sure that the oil fully covers everything. I like to leave a good 2cm between olives and the top of the oil just to be safe. Pop the lid back on and roll the jar around a bit to mix. Give the jar a good few turns upside down each day to keep all the flavours moving about. 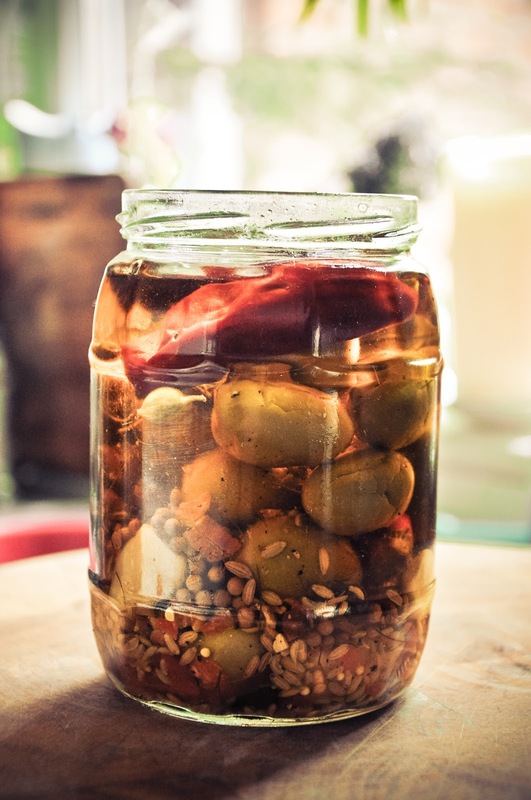 Try not to open the jar before you want to use the olives and keep it in a cool dark place. Play around with whatever fresh and dried herbs and spices you happen to have - orange peel is also really good, as is thyme. Olives with stones in work best if you plan on leaving them for quite a while as they hold their shape. Use black olives if you prefer or a mix of green and black is really good. You don't have to buy them already in oil, just pop them in a sterilised jar and top up with olive oil.